Recipe Studio is an online family cookbook by a mom & daughter team. In this blog, you’ll find Russian recipes from old notebooks as well as modern culinary experiments. Step-by-step instructions for healthy soups, traditional pies, challenging cakes, quick dinners, and anything else worthy of our family’s recipe box. Happy cooking! This snack came to life as a result of a nostalgic memory of dried bananas that were sold long ago back in Russia. It was made in China and was a popular addition to our not very plentiful diet. They used probably the smallest variety of bananas on Earth, and most likely dried them in the open air. Delightfully pink, moderately sweetened, this flavorful and elegant dessert will please your palates and perk you up on a hot and humid day. Read on, it's easy! 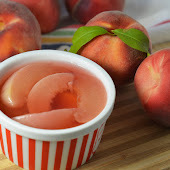 What you need: 5-6 medium peaches (white or yellow or both, the pinker the skins the better) 2 1/4 cups filtered water for syrup and 2 Tbsp for soaking gelatin 1/4 cup + 1 tsp sugar (I used unrefined organic sugar) Juice of a small lemon half (2-3 tsp) 1-2 Tbsp Peach Brandy (optional, but highly recommended) 1 envelope of gelatin (Knox brand was used) 4-5 ice cream bowls 1. Young kids loved it and many teenagers (including yours truly) enjoyed making it in a company of friends. On Christmas this past December it was tried once and again with great success. While it's very simple, the chocolate "kielbasa" is an example of a classic decadent dessert. This cake is based on a Pavlova recipe by Nigella Lawson, and inspired by another meringue cake that my (yes, Siberian) grandmother used to bake. 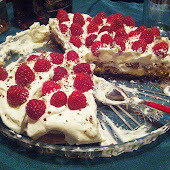 I baked it with my (Siberian) mommy, and it invoked some memories, so we decided to call it "Siberian Mommy. " Let it recall for some the sweetness of raspberries grown by a potato plot at a Russian dacha, let others remember the soft white of the Siberian snowdrifts, and let everyone feel just a bit of mother's love in this unsophisticated blissful treat. This time it was used to sweeten sour cream for a quick creamy topping. We often use sour cream whipped with sugar in desserts, and sour cream is always in my fridge. Substituting honey for sugar seemed like a good idea, especially if it was an unusual honey like the one I had. So I changed my mind and made this strawberry tart for all mothers of the world, including yours truly. There was no time to search for a crust recipe, so I took it from my mind using previous experiences. The recipe for the custard was taken from my old baking book, the rest came in place by itself. The dough is a puff pastry , but not a traditional multi layered type either. 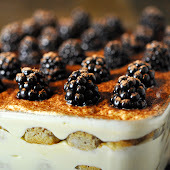 The crème that was used between layers is a combination of pastry cream and simple butter cream. Mama also added a grated lemon for the middle layer to make it even fancier than it was. When you are not inclined to spend hours mixing, grating, and baking, but still crave a homemade dessert, this improvised creation could come handy. The Muse of Improvisation visited me and pushed some buttons of my imagination. I rushed to my fridge where I had a cup of leftover sweet crumbs, the rest was done on magical impulse. 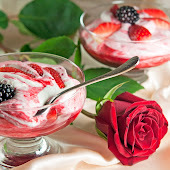 A British dessert dating back to the 1500's, fruit fool is as simple as its name suggests. 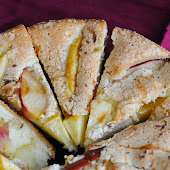 Traditional fool (or foole ) is nothing more than pureed fruit folded into sweetened whipped cream. For Valentine's day I took it a notch further and added a bed of peaches and bourbon syrup under the swirly folds of cream. 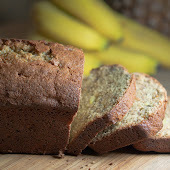 Banana bread is a classic American dish. I've been going to make it for a long time, and now that I have I almost regret it, because it is absolutely addictive! Having one slice is just not an option. For many years these sponge-like minis were one of the favorite festive desserts in my family. 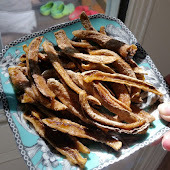 Not pretentious, pretty easy to make, they do not require a lot of baking skills or fancy ingredients, yet every time a serving plate of "Isabella" excites a cry of joy in all the participants of a party. I still have this recipe hand-written on a piece of paper yellowed by time, recipe shared long time ago by my then friend Lena Koppa, a fabulous Siberian home cook. Hurricane Irene is shuffling its way into New York City, and it's been raining like cats and dogs since yesterday afternoon. 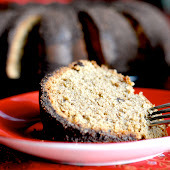 In anticipation of power outages, I decided to make a good use of my electric mixer and bake a cake. 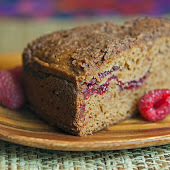 Raspberry puree with cognac, brown sugar and cocoa powder is what came to mind. 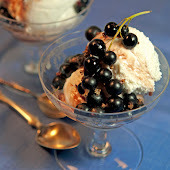 Just buy some simple vanilla ice-cream, and arrange it in a bowl with generous amount of currants and a splash of black currant liqueur (or jam mixed with brandy). Sit back and indulge in it! Notes: An even more simple way to eat black currants is to whip 1/2 cup sour cream with 1 tbsp sugar and mix it with berries. 5 hours to prepare (but ideally you'd want to keep it in the fridge for 4-5 hours more). It is summer, so I add berries. Blackberries, the most luscious of berries, are the best addition in my opinion, but you can go without if you like. Funny enough, we couldn't find kolache , one of traditional Czech pastries, in any Prague bakeries that were on our way. Maybe we just didn't know the right place... or maybe they became one of those things people make at home. Follow me... Real Prague knedliky were huge! Notes: What else you could do with this dough The dough was way too much for two persons, just for knedliky, so I decided to "diversify". May Peace, Love and Prosperity follow you at all times. I love Easter: winter with its snow aggravation is behind, the sun shines more, and people look happier. Today we had a lovely Easter branch with painted eggs, buns, and a variation of no-bake cheese cake Russian style that is traditionally prepared at Easter. 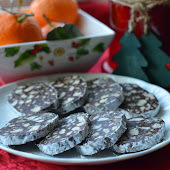 When shopping at my favorite Russian market, I glanced at a shelf with plain Russian cookies, cookies that I remember since my nursery school days. Indeed, there are some products that live decade after decade, and their popularity doesn't wither... Looking at these cookies, I remembered a simple recipe of a desert that I offer to your attention today.